what did he use as reference? 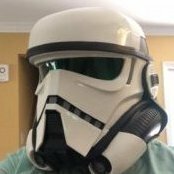 archive pics or an actual ANH helmet and armor?? wow, i think TM should publish a book. How do you get a TM Kit? Send "troopermaster" here on the board a PM and ask him . Hi TM, I've sent you a private message as I've heard nothing but great things about your armour and would love some advice on how or if I can buy this or anything similar over here in Australia. I'm a newbie here as you can probably tell too. I've applied to join the Terror Australis Garrison today. Two T Ms headed my way. I don't see VT armor on the 2nd Tree and I would like to know more. can someone explain it? VT armor is a TE-derived recast. DonÂ´t know the exact source, but itÂ´s origin is for sure. oops I didn't read the topic correctly, my apologies! Thanks for the Info! Same here... I've heard about that Yahoo album pics and wish i could have seen it before it went down. Just got in my armor from Paul, it all looks FANTASTIC! For those that have purchased, question on the thigh pieces. How do most people keep those up? It came with a snap mechanism near the top, but nothing to attach it too. Also, is the shin piece supposed to attach to the thigh piece, or does it just rest on the boot? Thigh, just get a big belt. I get webbed strapping â€” like a backpack â€” and then a big "backpack clip" from a hobby/fabric store. Loop 'em through, and snap! You're set. From what I've seen, Paul's stuff is the very best. When the time is right, I'm selling off my Rubies -modified ROTJ/ANH hybrid and going for a full custom fit through Paul for an extra ANH TK. Compare Paul's picture's to any original archive pictures and I challenge you to find any flaws at all. TM armor looks the best to me, with some extremely close runner-ups, none of which are commercial made. I just ordered a suit of Paul's armor, a ANH Hero TK in 1.5 ABS. Having seen several builds of his armor is really a work of art. Kind of late to the party, but I also like to add. I have built a RS suit (as a TD) and an ANH hero set + a ESB bucket from Paul. Both are great kits and fun to work with, but I prefer Paul’s kit anytime. And yes, it’s pure work of art.